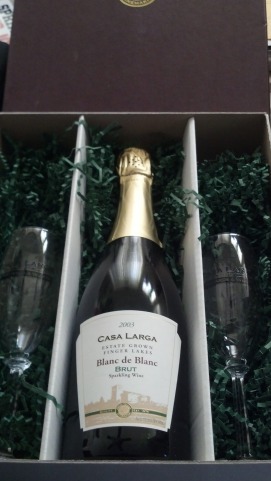 2003 Casa Larga Brut Blanc de Blanc | Wine Splash! I am a firm believer that you can drink sparkling wine any day, everyday. You don’t necessarily have to wait for a holiday or special event…. you can celebrate life everyday with a glass of champagne or bubbly. So yes, I do have my share of sparkling wines through the year. I drink sparkling at least once a month and in the summer, I have Prosecco weekly. But I will be honest and say that we did pop open this Blanc de Blanc to celebrate Valentines Day this year. That event and this wonderful bubbly reminded me that I need to open up more sparkling wines throughout the year. This Blanc de Blanc is from Casa Larga Vineyards and Winery in the Finger Lakes, New York. We were given this bottle from good friends who reside in the Finger Lakes and I must admit, I am jealous that they have total access to wines like these all the time. So I will have to adjust my schedule and route myself towards the Finger Lakes (and my friends) more often! This Blanc de Blanc is a light yellow and day bright in my glass. Aromas of apple, citrus, and yeast just tempted me even more! Medium weight across my palate with small, fine bubbles exploding like fireworks on Chinese New Year! Flavors of young Bartlett pear, crisp apple, and even slight hints of honey. On my second sip, I noticed more flavors of ripe apple, exotic citrus, apricot, and a long, dry biscuity finish. Fun and festive and the type of sparkling that makes every day feel like a party! Not often do you find a “vintage” bottle of sparkling wine and this one was a real treat. After tasting this wine, I can see why they decided to make a vintage bottle back in 2003. I give this 2003 Casa Larga Brut Blanc de Blanc a well deserved 92 points. It is perfectly balanced with just enough fruit and yeasty flavors. It is the type of wine that has you researching on how to get more before its gone! I would pair this Blanc de Blanc with mild to medium creamy cheeses, salads, hors d’oeuvres, baked chicken, or seafood. If you have a 2003 bottle of this sparkling, I would drink it in the next year because it is definitely at its peak and I can’t see aging it would make it any better later. Plus, I am sure you have a reason to pop this bottle open in the near future. Waking up in the morning, finding my keys, and seeing the sunshine would be great reasons to celebrate in my opinion. WineSplashing! !